Despite the stormy January weather, flowers have the power to brighten the dark days of winter. My painting, “Lupine, Poppies, and Rocks” caught the eye of juror, Peggi Kroll-Roberts at the Delicato Winery Show in Manteca, California. It received an honorable mention in the show which is on exhibit January 11 – February 4, 2017. The artist reception will be held on February 4th. What is not to like about art, wine, and appetizers? Technical notes: Rembrandt, Unison, Terry Ludwig, NuPastels, and Conte pastel pencils on U Art 400 sanded pastel board. A few photo references were taken while on a hike at nearby Brushy Peak in Livermore, CA last spring. It is a new year and with it comes a new show. I am part of a group show at the Danville Theatre Art Gallery that opens on January 9 and runs through February 28, 2015. The show features my work and that of fellow pastel artists Ruth Hussey, Mark Mertens, Pat Suggs, Debbie Wardrope. The theme of the show is “Romantic Expressions in Pastel.” Whether or not my work is viewed as “romantic” will be the judgement of the viewers. But, I do know that I need to feel a tug of the heart to commit to a painting and all that is involved. 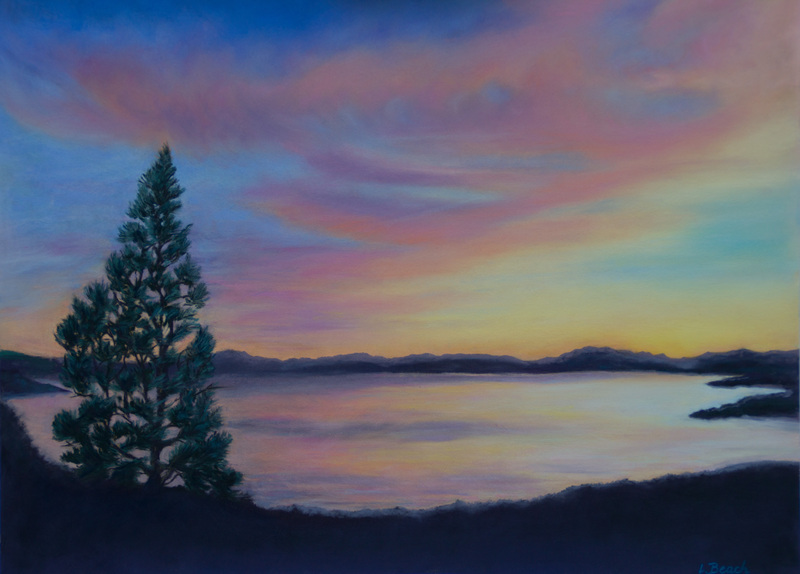 “Lake Tahoe Sunset” was inspired by the view from the overlook on the Mt. Rose highway between Incline Village and Reno last October. It was an ‘ah-ha’ moment when viewers stopped and took in the magical display of light and color in the sky and on the lake. My reference photo served to remind me of it. I used Sennelier La Carte sanded paper which seems to work well for the clouds in the sky. My pastels included a variety of Unisons, Terry Ludwigs, Giraults, Rembrandts, and NuPastels.